Faced with the decision about how to spend scarce transit resources, many communities have recently opted for suburban commuter rail. 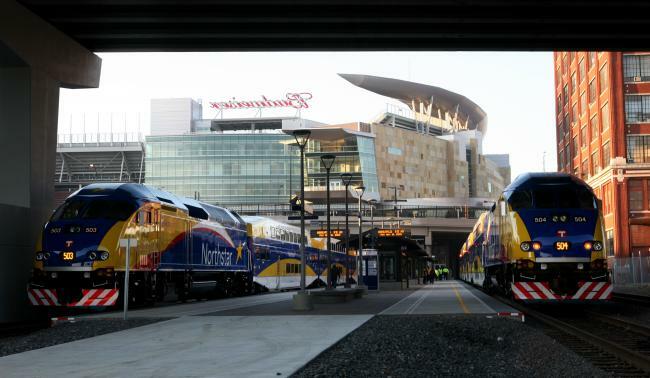 Minneapolis, Austin, Nashville and Salt Lake City have all added rail connections to suburban areas, says Yonah Freemark at the Transport Politic, and the trend is easy to explain. Suburban jurisdictions have a strong political pull in most regions. Connecting them via rail is seen as a popular investment that makes transit a truly regional enterprise. The results have in general not been impressive. As Jeff Wood catalogued last week on The Overhead Wire, these investments have yielded very limited ridership — especially on a per-mile basis. Nevertheless, cities continue to make plans to focus their spending on them: Kansas City announced in 2009 that it was considering a 150-mile commuter network; late last year, Indianapolis suggested its primary rail investment would be in a commuter line to its northeast suburbs. Except in the older cities (which have legacy commuter rail systems for the most part), the downtown job base has been falling off as a percentage of the metropolitan area’s total employment for decades. The rise of non-traditional working patterns that rely on Third Places and home offices mean fewer people need to get into central business districts for the same amount of work to be done. In most places, the center city simply isn’t a big enough attraction to require shuttling people to it from distant locales via big, heavy diesel trains running a few times a day. Indeed, in many cities, that work could probably be better done with a few express buses. In regions with metropolitan governance schemes, though, the appeal of commuter rail is hard to dismiss: It provides the suburbs appealing rail service, and politicians need suburban support if, say, they want to enact tax increases to pay for better transportation. The construction of those suburban lines, however, has too little of an effect to truly convince suburban voters of the appeal of transit, so, as Jeff Wood wrote, those people have little motivation to spend more on transit in the future. This is not a virtuous cycle. Elsewhere on the Network today: The Alaska Bicycle and Pedestrian Alliance reviews the growing number of states trying to protect pedestrians and cyclists through “vulnerable user” laws. Crossroads explores some of the dangers of infrastructure privatization. And Bike Portland reports that the FHWA has given its “interim approval” to painted bikeways. In Europe it's common for regional rail systems to get ridership comparable to that of the subway in the central city. But in America, this is unheard of. One reason for the discrepancy is land use: American commuter rail stations are typically surrounded by parking, while in the Paris region you see a different pattern with ample development next to suburban train stations. Are Regional Transit Agencies Too Beholden to the Suburbs?